In today’s world, even though we have progressed in terms of technology and various other aspects like art and architecture, we are still bound by our way of thinking towards certain human beings. Whether it may be based on race, color, ethnicity or religion. Something that is worth mentioning about is unfortunately discrimination and stereotyping against Muslims. The first thing that often comes in one’s mind when we see or identify a Muslim is that he is a criminal or a terrorist simply by judging him based on his way of clothing. For example, if we see anyone on the street with a men’s headdress or someone with a large beard, without second thoughts, the first thing that comes in our mind is that he is a criminal/terrorist and this is simply wrong. Even if we don’t say a word when you pass by them, a look is more than enough to hurt them to a point where they break down emotionally. The artwork that I am going to be presenting is inspired by the picture shown above; that shows how calling someone a terrorist based on their physical appearance can hurt them like a bullet metaphorically and break them psychologically. Armando Testa, an internationally famous Italian creative who found the biggest independent Italian communication group, has digitally designed the picture depicted above. I am going to be doing a painting on a canvas of size 40*60cm with the help of Mix Media, namely, Ink and Ink colored pencils along with paintbrushes. The type of painting that I am going to do is not a realistic one, but rather that of an expressionistic art, something that can be depicted based on how the viewer sees it. The main message that I wish to portray is to remove the stereotype that a Muslim=Terrorist. This needs to stop for good. Just because the media chooses to show of all the wrongdoings of the world like bombing and suicide attacks by terrorists, they become a huge influence towards everyone watching or reading the news that Muslims in general are to be blamed, as their religion, that is, Islam, is a religion that teaches them to be violent and fight with anyone who disagrees with their thinking. Even carrying this thought in our minds and spreading this false information, discomforts people more than we imagine. I am just an Indian student who was born and raised in the heart of the Middle East, that is, Dubai. Surrounded by Muslims literally all my life, all I have to say about them is that they walk, talk and act like any other human being and are no different than anyone else in whatsoever. All that I wish the world needs to know that, it really damages someone when you call them a terrorist simply based on their looks and religion. Just because you see some crime on television by a group of terrorists, it is wrong to start having an alter ego towards all the Muslim people you come across. The people, who you come across, are human beings like you who have nothing to do with all the terrorism and anarchy taking place in the world. All they want to do is to grow up educated and have a family and live and be a part of the society and also contribute towards the exponential progress of the planet. 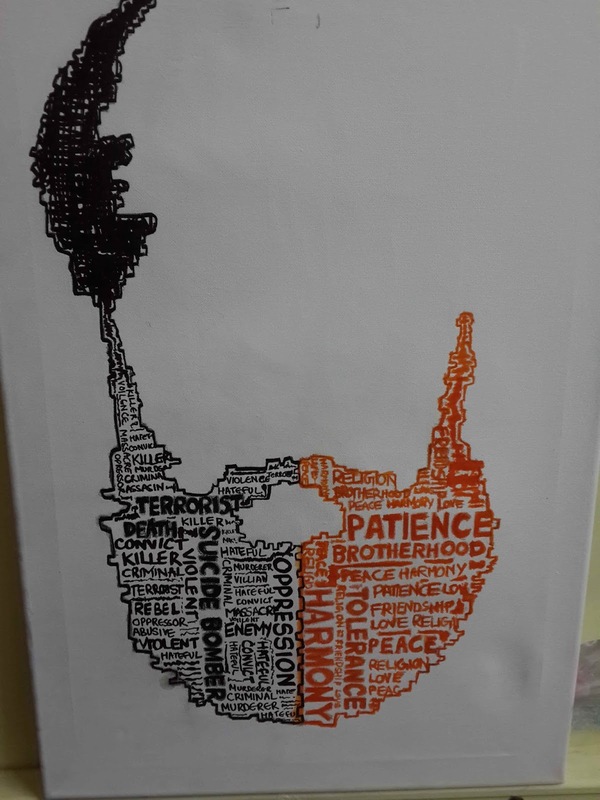 I hope my piece of artwork inspires people to spread the message that Muslims are nothing but peace-loving people who want to be acknowledged in the society just like the rest of us.